The irishdolphins.com mailbag has been busy recently in relation to the recently revived conflicts in Derreen / Fanore, Co. Clare, over access to the foreshore in order to see and swim with ‘Dusty’ or ‘Mara’. The background in brief (see also our Politics page) is that during the course of the last year or so the most popular point of access to the dolphin became increasingly over-used. The loose stone wall along the roadside was broken down as people climbed over it and the edge of the road itself became vulnerable, having been built up over the years to be much higher than the field. As we predicted last spring, the landowner not surprisingly became increasingly annoyed about this and he has now repaired the wall, made it higher, and put up some very aggressively worded notices warning people to keep out of the field. Explicit threats to the dolphin herself have also been made by this man and by other local residents who blame her for attracting unwanted tourism to the area. 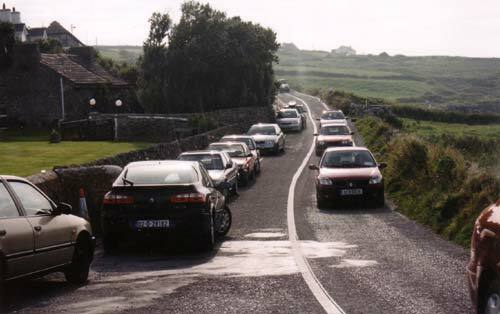 At the same time, efforts by Clare County Council to prevent people from parking cars on the straight stretch of road nearest the dolphin have made the situation worse by forcing people to park around the more dangerous nearby bends, as well as marking the spot very clearly with double-yellow lines, thus inviting passers-by to slow down and have a good look. Many of the people writing to us want to know whether landowners have the legal right to keep people out of their fields, and if so how they can get to see the dolphin. A few, however, blame us at irishdolphins.com for attracting too many people to Fanore and say we should remove all information about the dolphin from our website. Here is our response to some of the expressions of concern we have received. Probably not. We are not qualified to give a legal opinion but we don’t believe it is a criminal offence to simply cross someone’s land where no damage is caused to his property or livestock. If ‘direct action’ means a physical assault, then it will be the farmer who is in trouble with the law, not you. The law of trespass is civil law and as such the landowner would have to take out a private prosecution against you, which is unlikely unless there has been repeated and intentional damage. There is no 'right to roam' in Ireland as in many other European countries but access to the countryside has traditionally been widely tolerated until very recently. Nevertheless in legal terms it remains at the whim of the private landowner. The foreshore is state property open to all but that does not mean we have access to it unless we have a boat or a helicopter! The problems associated with access to the dolphin by an ever-increasing number of visitors are not new. 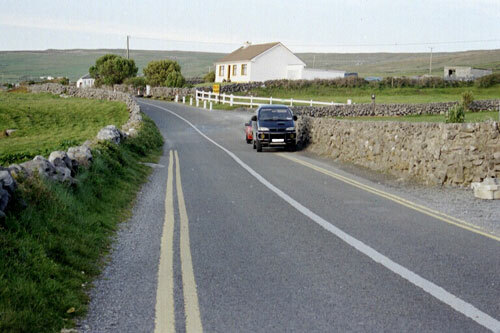 Conflicts over the destruction of boundary walls, car parking in unsuitable places, littering and general intrusion all date back to summer 2000 in Doolin. We attended a public meeting in September of that year at which these issues and others were raised, but unfortunately there was little willingness shown on the part of some interested parties to discuss the problems seriously. The division of authority and responsibility in this area between the local council, Duchas and the Garda Siochana makes it imperative, in our view, to arrive at a co-ordinated approach to managing the situation. Any management procedure should include input from biologists and conservationists (such as the Irish Whale and Dolphin Group) as well as local landowners and residents. This is something we have suggested to Clare County Council but unfortunately without any response at all. Duchas have also sat on their hands over this issue. Only the dreadful weather last summer prevented this issue boiling over before now; conflict will get worse this summer unless a coherent management plan is drawn up and accepted promptly. Unfortunately there is a real danger that if in the meantime there is an incident on the roads, the dolphin could get the blame. “There is too much traffic for a rural location”. We agree. There is too much traffic everywhere, not just in Fanore; the whole country is addicted to motor cars and our society seem incapable of organising an effective public transport system. However, the situation being as it is and likely to get worse before it gets better, most of us are dependent on cars, so while we are waiting for the revolution, we have to accept the need for car parking spaces in places where people want to park cars. We believe that with goodwill on all sides, it should not be that hard to arrange off-road parking within easy walking distance of Derreen. With the supposed crisis in farming it should be possible to persuade a landowner to open up a field in return for a reasonable parking charge which could provide a useful extra income in the holiday season. We have been told that at least one local landowner wanted to do this already two years ago but could not get permission from the council, on the basis that that would encourage more people to come. Hopefully by now it is clear that people will come anyway, so moves will be made to proceed with this obvious improvement to the situation, which will benefit everybody. Meanwhile we continue to urge people to park responsibly and not to block driveways, or to break the traffic regulations in any way. As regards the stone walls being knocked down, this is a problem wherever large numbers of people, including many from urban areas who are perhaps not used to accessing the countryside in a careful and respectful way, converge on an attraction. It is indeed appalling and unnecessary, and is especially disturbing in the unique landscape of the Burren, which owes so much of its beauty to the traditional dry stone walling. However there is a need to be pragmatic here and it seems to us that the harder access is made, the more needless destruction will take place, and that the only way forward is to accept that people will come and therefore to provide suitable access in the form of a gate and/or stile. Again this was in fact the case in the early days at Fanore, but due to conflict between a landowner and the council, involving complex issues of public liability, insurance and rights of way, the access was later denied, leading to the problem we have today. Once again, if those responsible would talk to each other, this problem could be solved. Also, there is some exaggeration going on here. The ‘holey’ Burren walls are very easy to knock down and also quite easy to put back up again. Lots of dolphin watchers would gladly lend a hand with this task if called upon. “You should take the information about Dusty off the website, you are only encouraging more people to come which will make matters worse”. Actually our site visitor statistics tell us that sadly we are not so influential as that. Of the people looking at our website, many are not resident in Ireland at all, and of those who are, most are existing dolphin enthusiasts who have already been to see Dusty and who check in to the site occasionally for news and updates. The dolphin featured prominently in local and national print media and on national radio TV, with an audience of millions rather than the few hundreds we have, before she was even mentioned on our website. Once something is in the public domain, it cannot be withdrawn, and we are not in the business of censorship. What we do strive for is accuracy and openness of information, which we see as essential to the operation of a democratic society. We could of course try to keep to ourselves any new dolphins we hear about, but we don’t believe that we or anyone else who is ‘first on the scene’ at such a privileged occasion should award themselves exclusive rights to visit the dolphin(s). On the contrary, we believe that the more people experience the magic and wonder of meeting a wild dolphin, the more chance there is of people making the changes in their own lives which will lead to greater harmony and co-operation throughout our society. It may also make people more aware of the marine environment and hopefully care more about safeguarding it. Experiencing a live dolphin in the wild might also open people’s eyes to the cruelty of keeping dolphins in any form of captivity, and so help to weaken the dolphinarium/ Sea World industry. To this end we are anxious to provide responsible, truthful and complete information on our website which will enable people to make their own decisions about what they do and do not do. We do not encourage people to break down walls or block people’s driveways with their cars and we do not really believe that our readers are the ones doing these things. 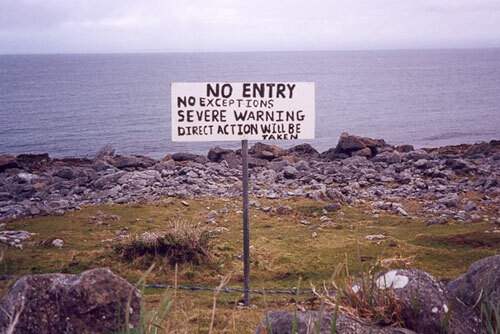 Moreover we constantly warn about the dangers of accessing the sea off Derreen with its rocky coastline and unpredictable surges, as well as having worked with the IWDG in providing a Code of Conduct for swimming with the dolphin. In short we believe that the information we provide helps people to behave more responsibly at Derreen rather than the reverse. It is the weaknesses in our own society which are the problem, not the dolphin, and we are anxious that in addressing these we should not scapegoat the dolphin herself, nor in any way limit or compromise her free choice, which is clearly to make contact with as many human beings as possible. There is certainly no question of ‘culling’ or otherwise interfering with the dolphin, as has apparently been suggested in the past within County Council circles, and those responsible for these ideas have been warned that it is totally illegal to even harass a wild dolphin, which is a protected species in Ireland as throughout Europe, never mind shoot it. They have also been told that the uproar which would result from such an intervention would have national and international consequences both on the political and economic levels. If nevertheless the threat of vigilante action does remain, then the best way of protecting the dolphin may be for her to be more in the public eye, rather than less. If you hear of anyone making threats of violence against the dolphin you should report him or her to the Gardaí whose duty it is to enforce the Wildlife Act. We have plenty of ideas as to how this situation can be managed to the benefit of all and with the dolphin’s safety and freedom the paramount consideration, as well as a lot of experience of how such issues have been managed and mismanaged in other locations both in Ireland and abroad. We understand fully the arguments against commercialisation and exploitation of dolphins whilst also noting that in tourist town Dingle for example, that very commercial interest offers extremely effective security for the dolphin; nobody here would dream of talking about shooting Fungie, even as a joke. Whereas in unspoilt west Clare, apparently, the regard for wildlife is not so sacrosanct! We advocate the equal rights of anyone in a democratic society, not just private landowners, to enjoy full access to the natural environment, whilst accepting that we do actually live in a society based on private and inherited property and urging respect for such property. We would be pleased to offer further advice and expertise if and when any management group is set up but we do not have the power or influence to initiate this. The best we can hope for at the moment is to act as a channel for information and exchange of views between interested parties. Including the dolphins! !